Ross County manager Derek Adams was full of praise for his side after which moved them to fifth in the league table. The Scottish Premier League debutants have now gone eight games unbeaten and Adams is keen to maintain momentum. "We're moving on up the league, we're eight unbeaten and we just want to keep it going," he said. "It was a very good win for us, against a team that are pushing for second position." Although stressing that his side were achieving success through team performances, Adams singled out the contribution of January arrival Ivan Sproule. "He's been excellent," said the Ross County manager. "He's got five goals in five games and we've got [Richard] Brittain scoring and [Iain] Vigurs scoring. "We've created good opportunities and finished them off well." The Highlanders travel to face Aberdeen in midweek and the County boss felt the win over 'Well put them in a confident frame of mind for the trip to Pittodrie. "We're looking forward to the game and we just want to keep on going on this unbeaten run," he said. "Obviously, we've opened up the gap with the teams at the bottom and we've closed the gap with the teams at the top." Adams also argued that his side's jump up the table showed why the SPL's proposed league reconstruction was a bad idea. Scottish football bodies are considering a format of two top divisions of 12, which would split into three leagues of eight midway through the season. 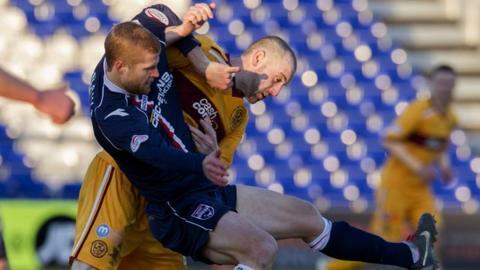 "We've cut the gap between Motherwell and ourselves to two points and moved up positions in the league," added Adams. "This is why I keep saying that the restructuring of Scottish football should not be happening. "I'm deeply against it and this is one of the reasons why."